My husband rented a temporary office two summers ago in a large, dingy commercial space in Wayland Square, Providence. Wayland Square is sort of an upscale shopping area encompassing a handful of streets on the east side of Providence. It is home to a variety of shops and restaurants, including a multitude of coffee spots, eateries, and independently owned stores selling all kinds of odds and ends. My husband’s three-month long office was kind of out of place there, but it was cool for him to be so close to all of the Wayland Square attractions. I spent a lot of time there helping him– so much time such that the office became like a second home for us! When he moved out of the space, we eagerly anticipated what would come into that spot. Another shop? A restaurant? Perhaps a salon? When we got wind a Thai restaurant was going to open in his former office space, we were incredibly excited, not only because we love Thai food, but because we wanted to see how that bare, stale space would transform into a restaurant! Two years after we last set foot in his office, we re-entered the building, only to eat some delicious Thai food with a few of my great friends from high school (and beyond of course) at Lim’s Fine Thai and Sushi! In considering how just the storefront has changed, we were blown away. It used to be just all glass windows. I love how they created the brown exterior–believe me when I say it looks so much better now! I didn’t take any pictures of the inside since the restaurant itself was kind of small, but it looked beautiful! It had lots of wooden and gold accents that gave the place a kind of sparkle. 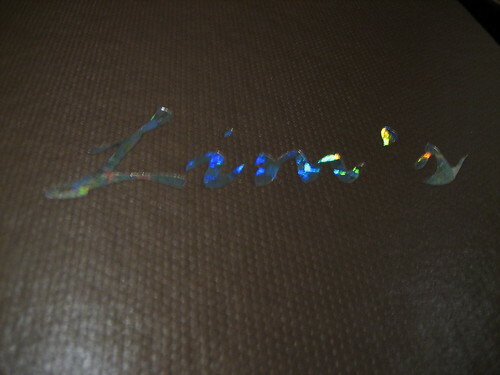 The sparkle is even reflected in its menu– I really love the mirror effect of the letters against the brown background! 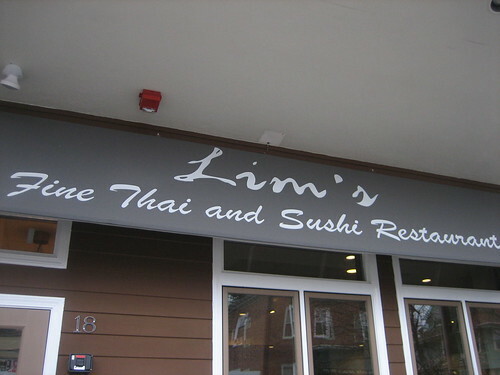 I feel that Lim’s is unusual because it offers both Thai dishes and sushi, which is not a combo I have ever seen before but is fantastic for this Thai-loving girl and her sushi-loving husband! One thing that struck me about Lim’s is its awesome tableware. 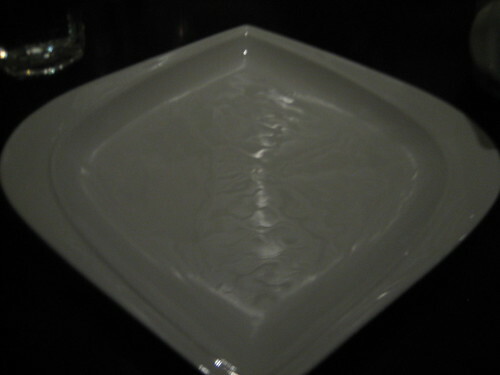 I heart how this dish almost resembles the shape of a lotus flower– I really want these dishes for myself! 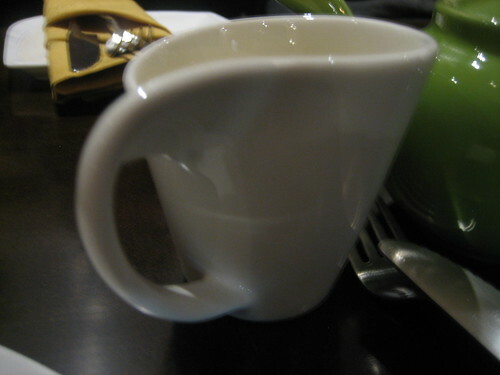 Even the mug that came with my green tea was striking– the lines of the mug were so interesting, and this is coming from a chica who barely notices things like that! Well enough about the decor and tableware– let’s get down to business. 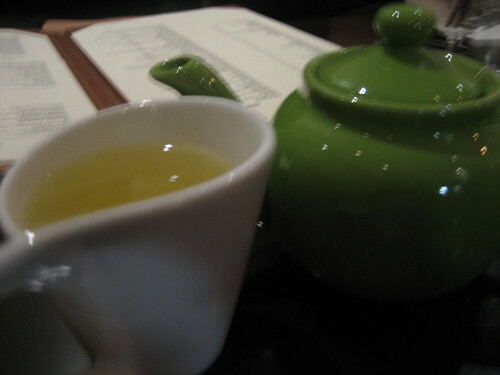 My green tea was a lovely drink to sip as I perused the menu. As you probably know, if there’s nime chow on the menu, I am going to get it without a doubt. 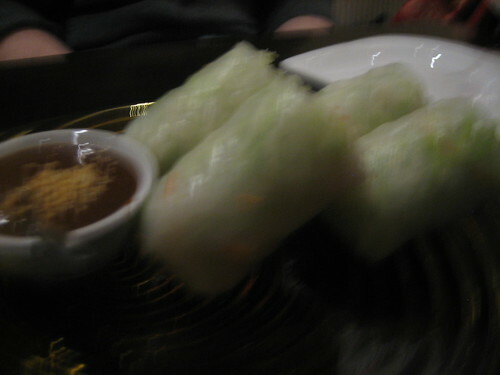 However, I didn’t spot any of these fresh summer rolls on the appetizer menu. Instead, I found a dish called “Vegetarian Noodle Wrapped” in the salad section of the menu, described as lettuce, carrot, tofu, scallion, basil leaf, and vermicelli in rice skin with peanut-hoisin sauce. Since this sounded like nime chow, I went for it. I think the menu is a bit confusing for the fact they put this dish in the salad section– I am glad I happened to even look there or I would have missed out on one of my favorite things! No worries though, because I ordered it and dominated it! 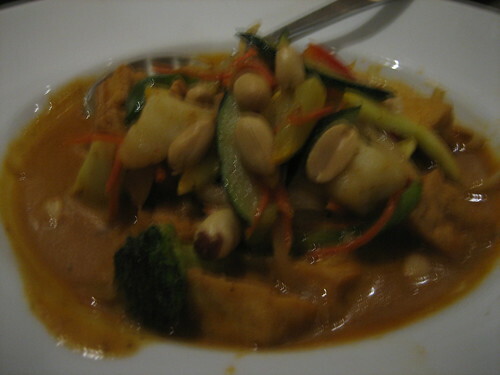 For my entree, I ordered peanut Massaman curry with tofu and vegetables. It was perfect. Tons of veggies, and tons of peanuts– just the way I like it! 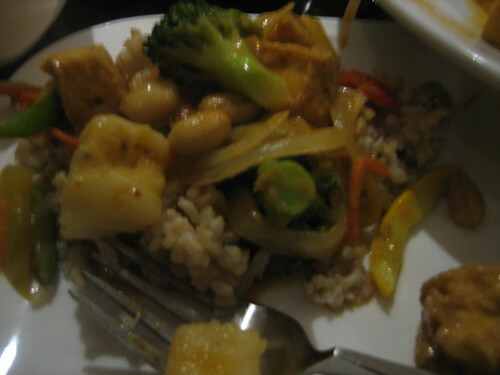 My friend D offered for me to take a picture of her vegetarian garlic choy, which I believe is a bunch of veggies and tofu in a garlic sesame sauce. I didn’t have a taste, but it looked amazing! I enjoyed about half of my dish served atop of some brown rice. Overall, the meal got two thumbs up! 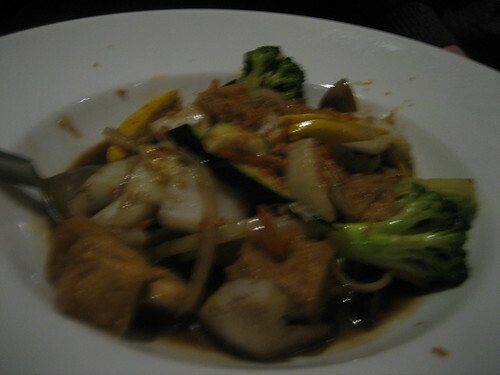 The Thai food at Lim’s is really tasty, and I would go back there in a heartbeat. It especially wins points for the fact it offers sushi too, which my husband happily indulged in. It’s a bit small, so I recommend calling ahead for reservations if you were ever to go– we only had a ten minute wait but it was also only 6, which is a time I expected to have no wait at all! The best part of our experience at Lim’s of course was the company. It was so fun to take old friends to this space, telling them how much it has changed since my husband and I spent the summer there all cooped up. We dined for an epic two and a half hours, just telling stories and catching up. It was a great night, through and through! Have you ever spent a lot of time somewhere, like a house, apartment, or even a school, only to go back after a while and have it be totally different? Do tell!